Every savvy business investor knows that this is a straightforward calculation for getting the best return for your dollar. Making the smart political investment isn’t quite so intuitive. The ultimate goal of any political investment is to get a favorable policy outcome – not merely to win a single election. In 2016, casino magnateSheldon Adelson turned a (relatively) small investment in Donald Trump into a massive windfall. Adelson wanted the federal government to reduce his tax burden and to implement an aggressive pro-Israel foreign policy shift. Adelson had been chasing these policy goals for decades; Trump delivered it all within 18 months. Adelson could afford to put millions of dollars behind Trump, but most of us can’t make that sort of financial gamble. We need to be smarter and more strategic with our political giving, and we need to have a better understanding of how to measure the return on that investment. Is it a good ROI if 100% of the campaigns you supported ended up winning in that election? Conversely, if every one of those campaigns ended up losing, was that a poor investment? The answer to both questions is the same: No. Smart political investing is about measuring the impact of your contribution. If you back a campaign that wins by 2% or less, then you made a great investment; your support meant more because the race was so close. If you back a campaign that wins by 20%, the reality is that your money likely made no difference on the outcome of that race. Now, suppose that you backed a losing campaign – one that lost by a margin of less than 2 percent. This was still a great investment because your contribution moved the needle. The winning candidate in a close race will still feel pressure to make political changes, while the loser can regroup and may end up being a better candidate in the future. This happened in Virginia in 2017; Democrats took control of the State Senate and came within one vote of the majority in the State House of Representatives. Republicans got the message, and now 400,000 more Virginians have access to health insurance. 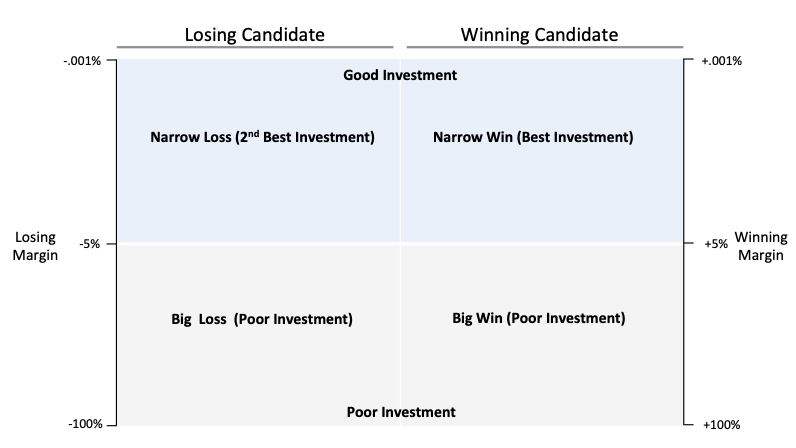 Narrow Wins: These are the best political investments. You backed a winning campaign and your contribution made a significant difference. Narrow Losses: Nobody likes losing, but your support for a tough campaign nearly changed the outcome. Big Losses: We rank a “big loss” higher than a “big win,” because there were collateral benefits. The campaign and the candidate likely learned from this defeat – and will be better in the future – and your contribution likely bumped up voter engagement and turnout. Big Wins: Usually a big win is easy to predict, which means you donated to a campaign that didn’t really need your support to ensure victory. Campaigns listen to donors and candidates may adjust policy positions as a result, so your investment wasn’t a total loss. We used these four outcomes to develop the following matrix for evaluating the ROI of political investments. Note that the image below is a sample matrix until election results are finalized.